At the Tiny Friends Farm in Hadleigh, Suffolk, Supreme believes that the very best food should be nutritious as well as ohh so delicious. Our food encourages natural foraging, and is perfect for tiny friends with big personalities. 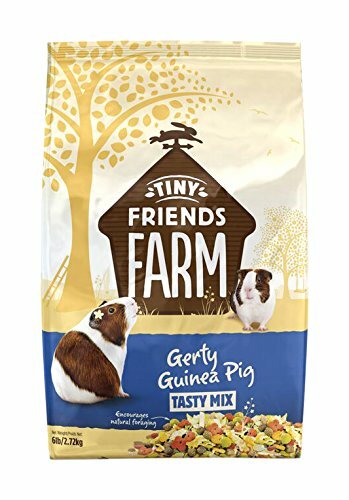 Gerty Guinea Pig Tasty Mix is nutritionally balanced and suitable for guinea pigs of all shapes and sizes. Delicious ingredients such as maize, oats, wheat, peas and Lucerne, as well as added Vitamin C provide a tasty everyday diet that helps promote your pet’s natural wellbeing and vitality. Remember to give your guinea pigs lots and lots of fresh hay every day, as well as their daily portion of Gerty Guinea Pig Tasty Mix. Your guinea pigs will also need free access to clean drinking water all the time, and will enjoy a small handful of yummy fresh leafy greens every day. If you have any questions about this product by SupremePetfoods, contact us by completing and submitting the form below. If you are looking for a specif part number, please include it with your message.